Excellent quality, workmanship and superb service. French Polishing Contractors - Est. 1870. F. Bennett & Son Ltd is certainly one of the oldest french polishing companies remaining with offices and workshop in London. Founded in 1870, the family run business is now owned and managed by Mr. R.W. Bennett, the great grandson of the founder. Using the hand skilled art of french polishing we prepare and treat wood to enhance the beauty of the natural wood. Traditional polishing methods are combined with the latest technology to provide heat and water resistant finishes for tables and wood surfaces. We can work on a variety of old or new, large or small furniture including dining & boardroom tables, panelling, bookcases, desks, staircases and doors etc, working in situ or off site depending on the clients needs. We have an excellent history of maintaining a good relationship with our clients, some of whom we have worked with for many decades, our corporate client list includes, Shell UK Ltd, B.P. International, Bank of England, Grosvenor Estates, Schroder Investment Management Ltd, Lloyds TSB plc, Royal Chelsea Hospital and Deutsche Bank. We have established and maintained excellent working relationships with our private clients too and can offer our services to both remedial revival work or larger project work. Based in the heart of Belgravia we are able to offer our services to London and the surround counties. 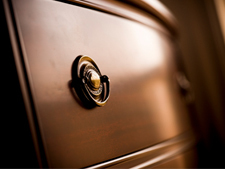 Whilst french polishing is our specialty, we able to offer further specialist services that compliment our business, for full details please see our ‘Services’ page.